Our CS:GO how to improve aim guide contains various ways to improve your aim in CS:GO, including details on the best aim training mods, mouse sensitivity tweaks and aim training exercises. You could sit there and watch thousands upon thousands of hours' worth of the best CS:GO player doing their thing, explaining the best positions to hold, how the game's economy works and what weapons are best to use in certain situations. Having a strong grasp of the game's mechanics, along with extensive tactical knowledge is fantastic- it really is - but you need to be able to back it up with decent aim. 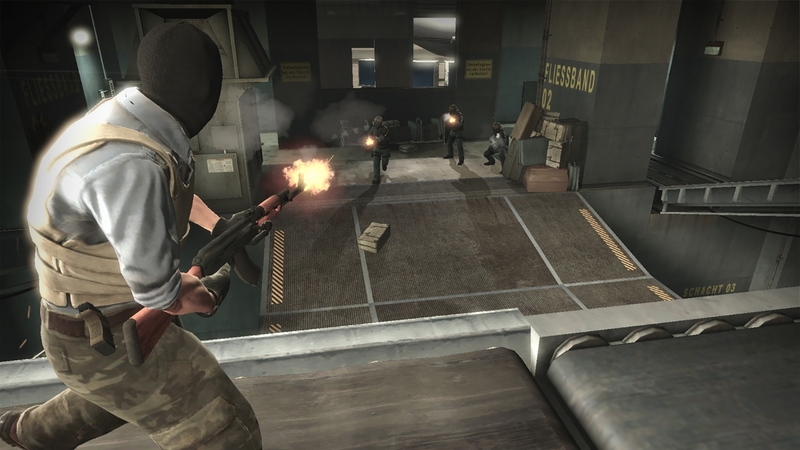 First and foremost, CS:GO is a first-person shooter. Shooting enemies is its bread and butter. Pointing and clicking on an enemy might seem like a simple activity, but it's especially important when only a few counter shots can drop you. Having strong aiming skills is an absolute must if you wish to climb the ladder. By focusing effort on your aim, you can carry yourself out of the lower ranks and into the higher tiers of play. If you're new to mouse and keyboard, or you've never really perfected your aim in an FPS before, it can be difficult to know where to start training and how to go about it. Thankfully CS:GO is filled with fan-made workshop maps which are perfect for upping your muscle memory, reflexes and pointer precision. Below we’ve detailed some of the best methods we’ve used to improve our own aim. While it may seem like a lot of hard work for a videogame, it’s extremely rewarding when you begin landing those headshot with ease. You won't just gain the benefit in CS:GO, but also in every other shooter you play on PC too! It’s absolutely vital that you’ve got a gaming mouse and a mouse pad with a smooth surface and some decent desk coverage. Gaming mice allow you to tweak your sensitivity or DPI (Dots-Per-Inch) and have much better sensors than the usual plastic that gets bundled with PCs. Not only does this mean you can adjust the mouse sensitivity to one that feels just right for you, but it’ll be more accurate and responsive when flicking to enemies as well. We recommend opening up our CS:GO Best Settings guide in another tab and having a read through “How to turn off Windows Mouse Acceleration” and “How to find the right DPI for you” sections. These should be your first steps when getting your mouse ready to go. Finally, when it comes to a mousepad, make sure you get one that’s a good size for your desk but not too small, otherwise there’s a danger that with low DPI you’ll just swipe your mouse off the pad itself. Having more room to toy around with eliminates this problem entirely. Now that you've found the perfect mouse sensitivity for you, it's time to do the same for your crosshair. For this you'll need to setup a config or auto-exec file, which we've detailed in our CS: GO - How to create an auto-exec file page. When you've got one together, make sure you open up and read our CS:GO - How to change crosshair guide as it contains absolutely everything you need to know about creating a new crosshair that fits your playstyle perfectly. You might be wondering why this is so important, but it's surprising how much of a difference having a crosshair you're comfortable with can make. When we first started out in CS:GO, we were directed to one video that built the groundwork for our aim, not only in CS, but for every other FPS we’ve played since. It’s a few years old now, but “Aiming help - Crosshair Placement” by a top player called adreN is a timeless, must-watch tutorial. It’ll teach you the basics of where you should be positioning your crosshair in CS:GO to give you the very best chance of eliminating enemies. The basic concept involves keeping your crosshair at a certain height, and pre-emptively positioning it all the time. This means gliding it across a corner as you move around, placing it in such a way that when you round the corner it’ll already be pointing at a popular sniping window in the distance. Crosshair movement shouldn’t be janky but should instead flow smoothly between point to point as you traverse the map. Focus hard on getting this right until it becomes an automatic process. A vital part of improving your aim is practice, practice and more practice. Once you’ve got your mouse set up nicely, and all your other video settings sorted, it’s time to set aside 10-15 minutes every time you boot up CS:GO to hone your crosshair accuracy and build some muscle memory. Below we’ve compiled a list of the best ways you can practice your aim, along with some tips on how to get the most out of them as well. Play Deathmatch - Hop into a Deathmatch matchmaking or server and forget about your KDR. Instead, focus all of your efforts on crosshair placement and attempt to land as many headshots as possible. training_aim_csgo2 - Despite the clunky name, this is a classic training map that you’ll want to subscribe to. It’ll throw up targets at certain intervals for you to click on, and you’ve got a mind boggling array of customisation options at your disposal too. You can set the targets to spin around wildly, shoot from various distances, change their size, decrease wait time between intervals and so much more. Quick tip - move your mouse to the centre of the training wall between every shot to really build up the muscle memory! Aim Botz - Another training map used by most of the pros, this gives you plenty of ways to practice landing shots on bots. Again it’s filled with customisation options to increase the difficulty as you gradually improve. Training Center 1.5c - A favourite of ours that offers a variety of different training scenarios in one glossy package. You can practice AWPing, shooting above crates, eliminating targets from a distance and so much more. All you have to do to access these training maps is to “Subscribe” to them from the Steam Workshop with the game client closed. This will download them automatically, so that when you boot up the game they will be installed. You'll then want to set up an offline match with harmless bots enabled from the “Workshop” menu. The aim training maps will be available to select below! For inspiration, here's CS legend Friberg using the first training map in our list. Note how he moves his mouse to the centre of the wall between every shot and takes a couple of quick sidesteps too? Both techniques help improve muscle memory and prevent this from becoming a predictable exercise.